Shanna was born in Great Falls, Montana but grew up in the St. Louis Metro. Shanna has spent most of her life in and now resides in Waterloo, IL. along with her husband and son. Besides music, Shanna enjoys Stage Theater and has been apart of the Monroe Actors Stage Company in Waterloo. 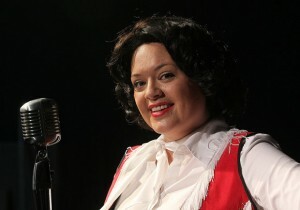 Shanna loves to entertain and loves Patsy Cline. She sees Patsy as her true inspiration. Shanna has been singing the songs of the beloved country music singer since she was a small child, growing up hearing those songs playing on her parents record player. After singing throughout the years with bands such as “Dixie Express” and “Missouri’s Most Wanted” and being asked to perform Patsy’s songs, she decided to reenter the field of entertainment and focus on just Patsy. “Crazy” has to be her most requested song along with Shanna’s personal favorite “Sweet Dreams”. Shanna is truly excited and looking forward to performing with and along side Steve Davis as Elvis, Thomas Hickey as Buddy Holly and the Mid-South Revival Band. She can’t wait to meet all the true Memories of Elvis fans. You can also find more information on Shanna’s Facebook as “Today’s Patsy Cline”.